Indeed, spring has sprung a bit early here in Florida. Record-high temperatures have been common across the state this week. It appears that next week will be a little cooler, but March also begins next week. That suggests that most, if not all, winter (as Florida goes) weather likely is behind us. Time will tell. But, with spring more or less upon us, rainy season will be here before we know it. That means it is important to get as many volunteer observers into the network in Florida as possible. March Madness is an important conduit for new observers. More details are given later in this news letter. This newsletter also includes a few reminders about observational practices, a summary of 2017 CoCoRaHS observations, a listing of your observation comments that caught our eye, and information about current conditions and the outlook for spring. We hope enjoy this newsletter, and feel free to drop us a line any time! March Madness begins soon - let's keep the cup in Florida! Recall that Florida won CoCoRaHS March Madness in 2017. We want to do the same this March, helping the network expand even further across the Sunshine State! For a state to win March Madness, it has to be the one in which the greatest number of new observers was recruited from March 1st to March 31st. The prize is a stronger network and also the CoCoRaHS Cup, pictured above, which has been circulating across the state since last year's win. If you have friends, family, co-workers, or anyone you know who is interested in joining the network, just follow this link . 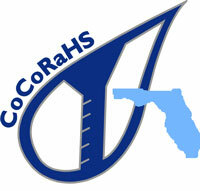 If you have questions or are a reporter looking to do a news story on CoCoRaHS or or are with an organization that is positioned to promote CoCoRaHS, please contact Danny Brouillette at dbrouillette@coaps.fsu.edu or 850-644-0719. Your observations are useful to many people. So, we do take some time to perform quality control on your observations. And, that raises the first point: if somebody contacts you, usually by e-mail, with a question about one of your observations, please be sure to read that message and respond to it in a timely manner. By addressing quality-control concerns, we together can assure the continued great usefulness of CoCoRaHS data by a variety of people. One common error that we continue to see is the reporting of multi-day rainfall totals in the daily report form. That is incorrect: there is a special multi-day report form, and details can be found under the October 2007 heading here. Comments are always good. They can be used to note special details about your report for the day. Sometimes, we who are performing quality control can use comments to take note of irregularities. Speaking of comments, a common type of comment describes accumulation in the gauge from fog, mist, or dew. Be careful with this. None of these are precipitation and should not be reported as such. However, if you are sure that a light drizzle or even rain is occurring (or has occurred), then report what fell into the gauge as precipitation. But perhaps include a comment! As always, feel free to field any questions to us or your local or regional coordinators. 9 December 2017, Gainesville 1.7SE, Alachua County (AL-26): "Seems to have stopped raining after two days of almost nonstop rain and true THUNDERSTORMS last evening-with temps in the low 50's. Just tree drip at the moment." 3 January 2018, St. George Island 2.2 ENE, Franklin County (FR-6): "This trace is from snow and sleet. Only the second time I remember snow on the island in 25 years or so." 13 January 2018, Daytona Beach Shores 1.8SSE, Volusia County (VL-42): " Yesterday's high was 83F. Fast-moving hit/miss pre-frontal showers accompanied by gusty SW/W winds raced in from the WSW in the afternoon, accounted for the 5th straight day of measureable precipitation." 1 February 2018, Marianna 3.9E, Jackson County (JK-3): " Few clouds this morning and currently 41F although the low was 35F just after 1AM. No rain to report. Yesterday was bright and sunny in the afternoon with a high of 64F. Pear trees and apple trees beginning to show leaves, a sign of Spring around the corner." 17 February 2018, Ormond Beach 3.5SE, Volusia County (VL-5): " Sudden onset of fog this AM: At 4 AM skies were clear, stars brightly visible. By 5 AM patches of ground fog were forming. By 6 AM we had dense fog and a misty drizzle falling out of it, leaving 0.02" in rain gauge." The El Niño-Southern Oscillation is an important climate (or teleconnection) pattern that is monitored, especially during winter, because it tells us a lot about how weather/climate patterns may behave here in Florida. NOAA's Climate Prediction Center continues a La Niña Advisory owing to continued negative-ENSO conditions in the equatorial Pacific Ocean. However, the negative sea-surface-temperature anomalies in this region of the Pacific have decreased in magnitude in the last month, as shown in the plot just below. Smaller negative anomalies foretell a return to ENSO-neutral conditions as the climatological boreal spring begins and proceeds. Ensemble modelling suggests this change of phase, as does the propagation of a Kelvin wave across the basin, and the official outlook calls for increased probabilities of neutral conditions in the coming few months. For the period beyond this spring and early summer, it is too early to say with certainty what will be the ENSO phase. This time of year is a notoriously difficult one for forecasting ENSO for the following fall and winter because of the so-called spring-time prediction barrier. La Nina winters tend to be warmer and drier than normal in Florida. This largely has borne out as, even if January had colder-than-normal conditions with mixed results statewide on precipitation. December was warmer and drier than normal, and February looks as if it will have much warmer than normal conditions by the time the month is over. Drought has been problematic on the panhandle but is currently in a state retreat as shown by the most recent US Drought Monitor. However, dry conditions are beginning to appear on portions of the peninsula, which will need to be monitored carefully as spring wildfire season approaches. The outlook for temperature and precipitation from the Climate Prediction Center for climatological spring (March-April-May) is consistent with the end of a La Nina episode - heightened odds of warmer- and drier-than-normal conditions in Florida and immediately adjacent parts of the Southeast.